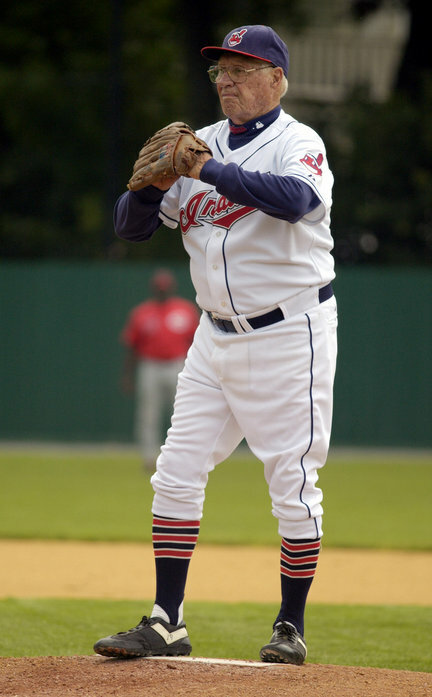 Bob Feller takes the mound at 90 in the 2009 Hall of Fame Classic (Photo: AP). Over the weekend, it was revealed that Hall of Fame pitcher Bob Feller has been undergoing treatment for leukemia. At 91, Feller is the third oldest living member of the Hall of Fame (behind Bobby Doerr and Lee McPhail, who are both 92), but the former Cleveland Indians fire baller has always been ahead of his age. Well into his senior years, Feller could be seen on the mound at an Old Timer’s game or charitable event; at age-90, he even toed the rubber in last year’s inaugural Hall of Fame classic. So, the thought of Feller being mortal is a little startling. Bob Feller has had such an illustrious baseball and military career, that it would be impossible to sum him up in one blog post (for that, check out Frank Deford’s profile of Feller in the August 2005 issue of Sports Illustrated). Besides, that would read like a eulogy, and one thing you can be sure of is Feller is not about to surrender to any disease. However, two events that occurred this week evoked thoughts of Feller, even before the unfortunate news about his battle with leukemia, and both provide a perfect illustration about just how extraordinary Feller was as a player. As a young man, Feller used a power windup to deliver a blistering fastball that some accounts claim traveled faster than 107 mph. The news about Stephen Strasburg’s impending Tommy John surgery was seen as major blow to the baseball world because it seems likely that it will rob the game of a once-in-a-generation talent. That claim is certainly debatable, but whenever the latest phenom emerges, it is impossible to not hearken back to the debut of Bob Feller. In the case of Strasburg, however, the comparison is particularly compelling when you consider the hype surround both pitchers’ talent, the princely sums paid to each as a rookie as well as the arm maladies faced by both in the early portion of their careers. When Bob Feller broke into the major leagues on July 19, 1936, he was only 17. Before that, he had grown up on a farm in Van Meter, Iowa, where his father, Bill, famously built a baseball field and organized a local team so his son could hone his baseball skills. However, it was only after mostly playing third base that Bob Feller was introduced to the mound. Reportedly, Feller struck out 23 batters in his first game as a pitcher and the rest is history. Before long, at the age of 15, Feller was signed to a pro contract by the Fargo-Moorhead club of the Northern League, setting into a motion a whirlwind assent to the major leagues that had the potential to revolutionize the economics of the game. After signing his contract with Fargo-Moorhead, a team in which the Cleveland Indians had a financial interest, Feller injured his arm in a plow accident on his farm and never reported to the club. Fearful of losing the rights to the young phenom, Indians GM Cyril Slapnika induced Feller to sign a contract with another minor league team in New Orleans. Once again, however, Feller never made so much as one appearance for the Pelicans. Instead, he was summoned to the pitch for the Cleveland Indians. At first, Feller got his feet wet in the bullpen, but after displaying his prodigious fastball, Indians manager Steve O’Neill decided he would be best suited for the rotation. Once again, the decision was quickly rewarded as Feller gave up only one run and struck out 15 in a complete game victory over the St. Louis Browns in his first major league start on August 23. Then, as if to prove the performance wasn’t a fluke, Feller rebounded from a couple of shaky starts to tie the American League record for most strikeouts in a game when he set down 17 Philadelphia Athletics on September 13. By the end of the season, the word was out. Bob Feller was being described as possibly the most talented pitcher to every pick up a ball. Opposition players raved about the velocity of his fastball, which St. Louis Cardinals’ All Star Pepper Martin, who faced Feller in an exhibition, claimed was so fast he couldn’t see it. Rapid Robert was about more than just the fastball, however. Despite coming to Cleveland as essentially a one trick pony, he quickly learned a dynamite curve that Boston Red Sox manager Joe Cronin told Pittsburgh Press sportswriter Chester L. Smith was the “best [he’d] ever seen in the American League”. 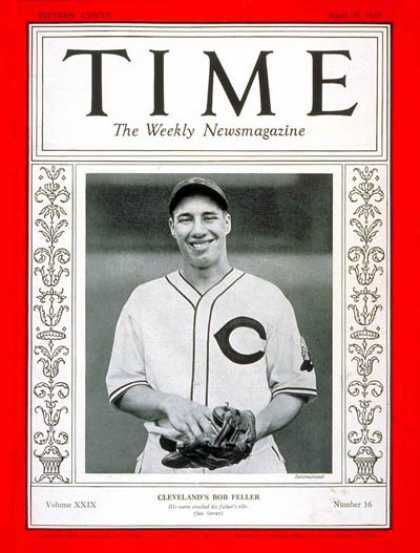 On April 19, 1937, Bob Feller was featured on the cover of Life magazine at the tender age of 18. So, by all accounts, the Indians had unearthed a true baseball gem. The only problem, however, was there was some doubt as to the legality of their claim to his services. You see, at the time, the major leagues and minor leagues had an agreement that prohibited big league clubs from promoting players from the sandlot directly to the major leagues. What’s more, Commissioner Kenesaw Mountain Landis also had set a precedent of not recognizing contracts signed by players under 17, so on this point too, the Indians seemed to be on the thin ice. Luckily for Cleveland, Landis realized that he could not grant Feller free agency. 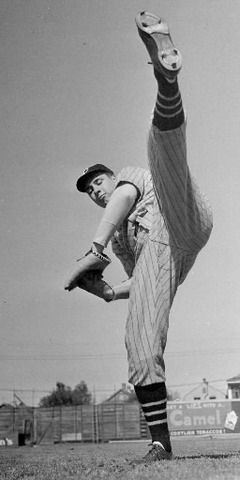 Not only would the decision have triggered a wild bidding frenzy for Feller’s services, which would have altered the economic stability that the leagues had fought so hard to establish, but it would have also opened the door for several other players to use loopholes to void their contracts. So, after months of speculation, Landis ordered the Indians to pay the Fargo-Moorhead club a fee of $7,500, but allowed the club to retain their young ace. With his contractual status resolved, it was now up to the Indians to pay Feller, who emboldened by a new appreciation for his value sought an astounding figure of $20,000. Although he eventually agreed to half, the figure was still the highest ever paid to a rookie. Secretly, the Indians had to be thrilled with the bargain price they paid, but when Feller was diagnosed with a “snapped” muscle in his right elbow after his first start of the 1937 season, their outlook was probably less sanguine. From that point until July 4, Feller only pitched in two more games encompassing two innings, with Indians’ management vowing to take the unusual step of shutting him down for the entire year if necessary. Fortunately, that wasn’t necessary, as Feller’s arm rebounded over the summer and held up to produce a Hall of Fame career. Ironically, Strasburg might have been better off if the Nationals had been as cautious with him as the Indians were with Feller over 70 years ago. 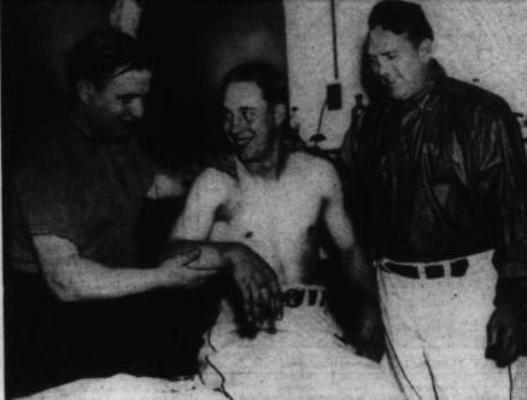 Indians’ trainer Lefty Weisman and manager Steve O’Neill examine Bob Feller’s right arm after the young hurler suffered a “snapped muscle in his elbow” after his first start in 1937. Despite the ominously worded diagnosis, the injury was not believed to be serious, although Feller only pitched two more games up until July 4 of that season (Source: Pittsburgh Post-Gazette, April 29, 1937). In a minor league game last Friday, Cuban import Aroldis Chapman threw a fastball that was clocked at 105 mph. Word of the eye popping reading immediately brought to mind similar claims made about Feller. In a 1941 film produced by the American League, Director Lew Fonseca used rapid motion cameras to produce slow motion and still frames of Joe DiMaggio’s swing and Bob Feller’s fastball. To illustrate the later, Fonseca had Feller throw a fastball against a motorcycle traveling at 87mph. Based on various calculations from the free frame footage, it was estimated that Feller’s fastball was well over 100mph. Using a more scientific approach in 1946, an measuring device used by the Army to determine the velocity of speeding bullets was brought in to gauge Feller’s fastballs. According to the test, which was conducted at Washington’s Griffith Stadium, Feller’s gas checked in at 98.6 mph. However, when adjusted for the speed at release (which is how fastballs are measured now), the reading translates to 101-102 mph. Throughout his career, Feller’s fastball so impressed observers that there were repeated attempts to measure it. Although the accuracy of those measurements is somewhat in doubt (Feller has claimed that he was clocked as fast as 107.9 mph), it’s pretty safe to say that Feller’s fastball has not been surpassed by many others. Bob, I pray God would bless you in a manner that would allow you to become better and better – each day and in every possiible way.